The Stewards plan to swim 26kms in total – the mine’s distance off shore – by swimming along the coast from Pātea to Whanganui too. Despite the risk of falling victim to the sea he’s trying to save, a 61-year-old doctor is preparing to swim across a proposed-seabed mining site more than 20 kilometres off shore. Athol Steward is campaigning against the planned seabed mine off the coast of South Taranaki by swimming 15 kilometres in the shape of an X across the area. “The depiction of a cross is a ‘no-go zone’ or ‘no entry’ – that is the graphic or symbolic message,” Steward said. Trans-Tasman Resources (TTR) has been trying to get consent to mine 50 million tonnes of ironsand from a 66-square kilometre area off the South Taranaki Bight for years. Its consent has been denied, accepted, and then overturned in the Court or Appeal late last year and is currently sitting before the High Court. TTR has appealed the Court of Appeal’s decision against it. Steward said he has been against seabed mining from the start. In September, Steward and his Christchurch-based son Lloyd, 30, came up with the campaign ‘Making Waves’. “We were very keen on a swim at the mine site, just because of that symbolism it carries. 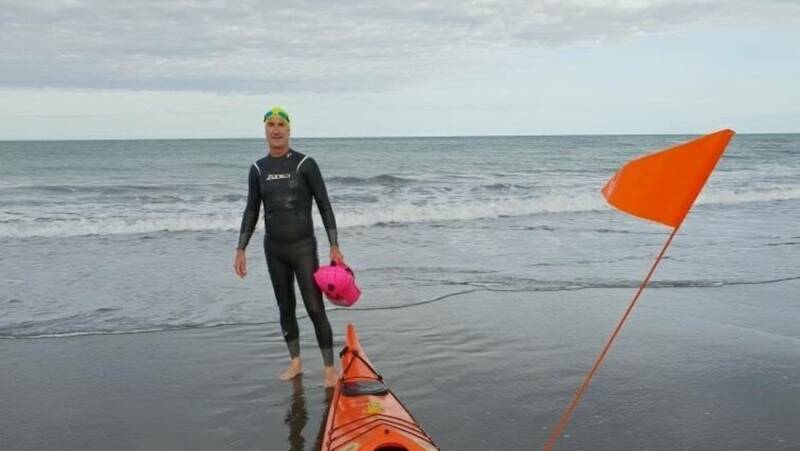 Steward plans to swim 26km all up – the mine’s distance off shore – by swimming along the coast from Pātea to Whanganui too. The pair, who have very little ocean-swimming experience, and their crew are ready for action but have to wait for the right weather conditions – but have seen nothing but rough days so far. In 2017, Steward walked from Raglan to Pātea to raise money and awareness about the proposed seabed mine. He raised $10,600 for the anti-mining parties’ court costs. He’s hoping to reach $100,000 with this Givealittle campaign to cover the costs to come. South Taranaki Coastguard life member John Linn said the waters the Stewards were planning to swim were dangerous. “The thing with the South Taranaki Bight is it can change quite quickly, like the conditions on the mountain,” Linn said.